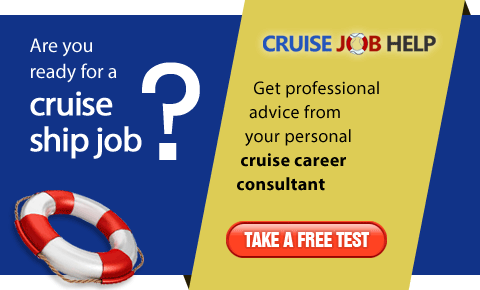 A Steward or Stewardess on-board a cruise ship is the equivalent to a maid in a luxury hotel. As you know, I am responsible for cleaning the guest cabins. I have a section of 20 cabins and an Assistant who helps me. My day starts around 5:30 am, and the first thing I do is to check that my Assistant is present and ready. We go to the Chief Housekeepers office to sign in for the shift, and to get our pass keys. With this pass key we can open all the cabins in my section. I also get the key for the trolley lockers, where I keep my working trolley. The trolley contains all the things I could possibly need on my shift, such as fresh towels (face towels, hand towels and bath towels), miniature bottles of shampoo and conditioner, soap, shower caps, cleaning buckets, various cleaning material and cloths. In the morning I go to the ship's laundry and pick up the towels I need, leaving the trolley outside in the corridor. Whilst folding the towels I have chance to see who is leaving their cabin. Besides knowing which cabin is empty and can be cleaned, this is usually the only time I am able to talk to the guests. You might know that my salary is mostly paid by the tips I receive from the guests, so it is important, to know the guests and greet them by name etc. 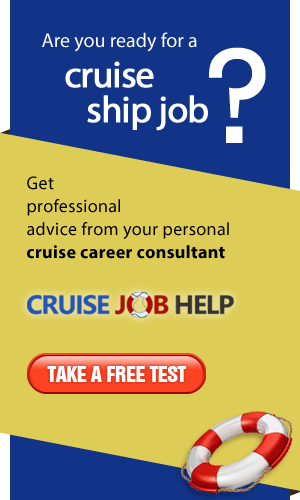 Very often they have questions about the next port where the ship will stop and want some inside tips. I enjoy talking to the guests, hearing how they experiencing their cruise, and that they are (hopefully) having a good time. As soon as the guests leave the cabin I go in and clean. 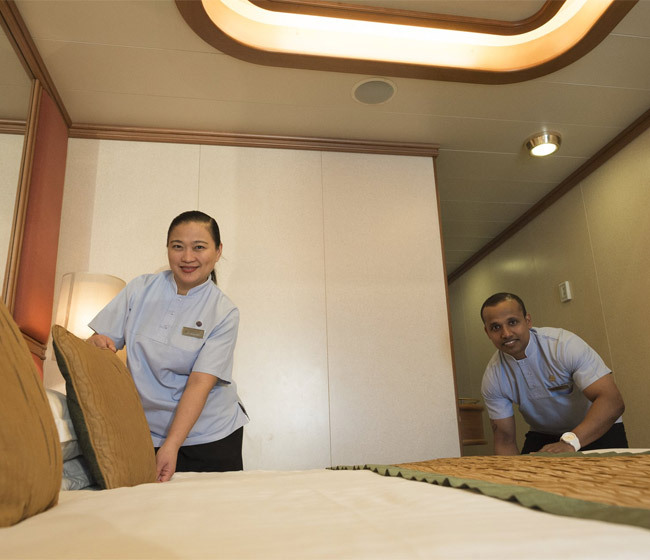 Most Cabin Stewards work in the main room of the cabin and the Assistant cleans the bathroom. On the days we have to change the bed linen we do this together. My duties include making the bed, emptying the bins, cleaning the drinking glasses, emptying and filling the ice-bucket, checking and re-stocking the mini-bar, and dusting. Before leaving the cabin, and while the assistant is vacuuming the floor, I check the bathroom to make sure it has been cleaned well, and has fresh towels. If all goes well I am finished at around noon. I hand in my pass keys to the Chief Housekeeper and go for lunch and for a short break. By 5 pm we start with the turn-down service. This is when the first guests go for a cocktail, for a snack or an early dinner. I collect the pass keys again, then turn-down the bed, place the obligatory chocolate on the pillow, clean the glasses, replace the ice and refill the mini-bar if necessary. The bathroom is cleaned again and towels replaced if necessary. I then place the Daily Program on the bed, so the guests know the on-board program for the next day. Once all the cabins in my section are done, which is often around 9 or 10 pm, I am finally off duty. I always prepare my trolley as much as possible for the next day. Then I go to the Chief Housekeeper office to sign off and hand in my pass keys.